A Mojito Cocktail with a fun Italian twist, this cocktail is made with limoncello, fresh lemons and plenty of mint. It’s super refreshing, delicious and perfect for sipping on when the sun is shining! Hands up if you love a cocktail!! I loveee cocktails like a simple but iconic Aperol Spritz or my Rose Cointreau Cocktail and for two main reasons one, they delicious (obv) and two, they’re made with so few ingredients it ain’t gonna break the bank. Woop! So How’s this Mojito Cocktail Different? It’s still got all the mint and all the rum but instead of fresh lime I’ve used juicy and zingy lemons and a good measure of limoncello because it’s just too good! This mojito is incredibly refreshing and perfect for sipping on a hot and sunny afternoon or well, just because (my excuse the majority of the time). 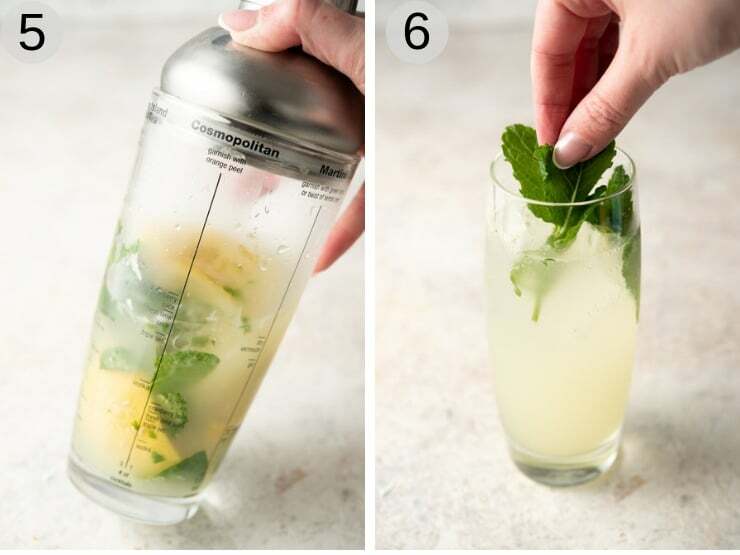 Put the mint leaves, sugar and fresh lemon in a large cocktail shaker and muddle, bashing the lemon and mint until most of the juice is released (photos 1-4). Add the limoncello and run and top the shaker with ice. Shake until thoroughly mixed and ice cold. Divide the cocktail between two high ball glasses filled with ice and top up with soda water. Garnish with mint and lemon if desired (photos5 & 6). Which Rum is Best to Use to Make a Mojito? I like to use a white rum for this cocktail not only for the flavour but because a dark rum would change the colour making it brown and cloudy rather than clean and light. As much as I love a cocktail it wouldn’t be complete without some little nibbles to go along with it. Dips are always an easy one, why not try my Sour Cream Pesto Dip or Taleggio White Bean Dip. Deep Fried Sausage Stuffed Olives are always a winner or you can go for some super easy Crostini and serve them with some cured meats and cheese, yum! Go for a good quality limoncello (homemade is best and way cheaper) but cheap store-bought varieties are often made with artificial lemon powders and don’t taste nice. Make sure to fill the glass with ice to keep the drink nice and chilled. Bashing the mint and lemon juice releases a ton of flavour and juice. Make sure to do it with a wooden pestle if you don’t have a cocktail kit so you don’t break the glass. 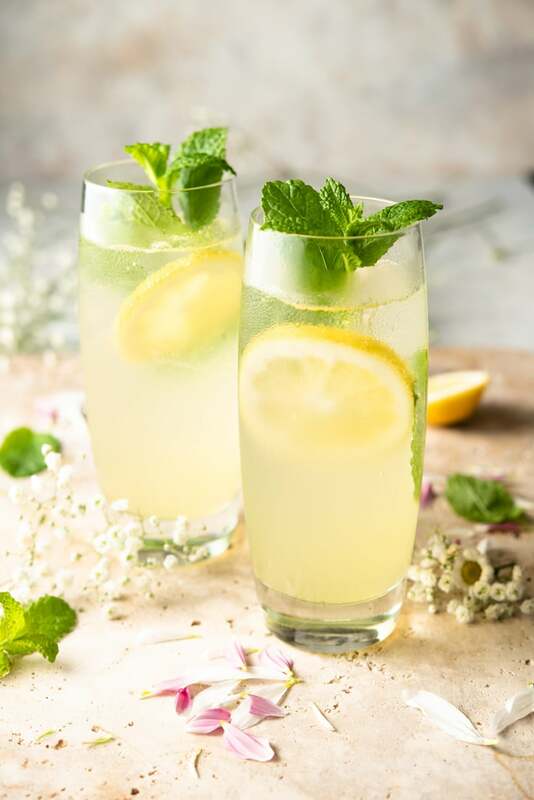 To make it virgin (without alcohol) replace the rum and limoncello with a good fizzy lemonade such as San Pellegrino Limonata and garnish with more mint. It’ll be super refreshing and zingy without the booze! 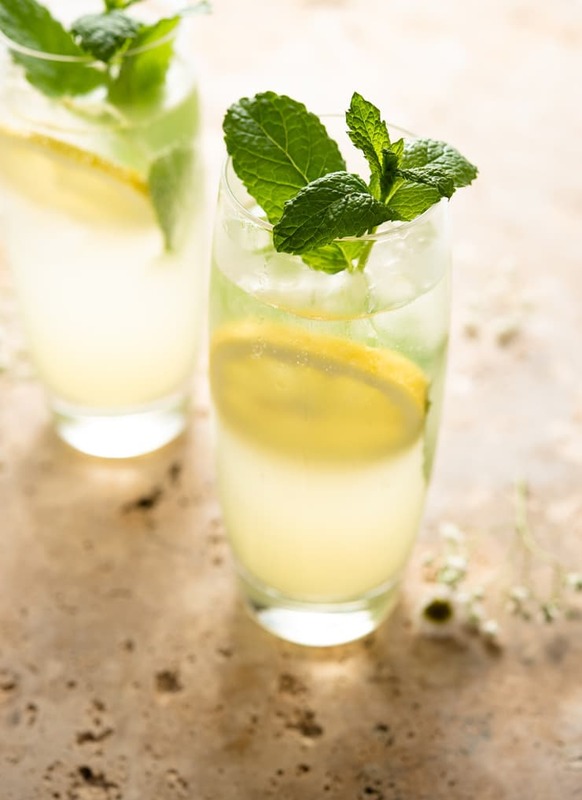 If you’ve tried this Limoncello Mojito Cocktail or any other recipe on the blog please let me know how you got on in the comments below, I love hearing from you! You can also FOLLOW MEon FACEBOOK, INSTAGRAM and PINTEREST to see more delicious food and what I’m getting up to. A Mojito Cocktail with a fun Italian twist, this cocktail is made with limoncello, fresh lemons and plenty of mint. It's super refreshing and delicious, perfect for sipping on when the sun is shining! 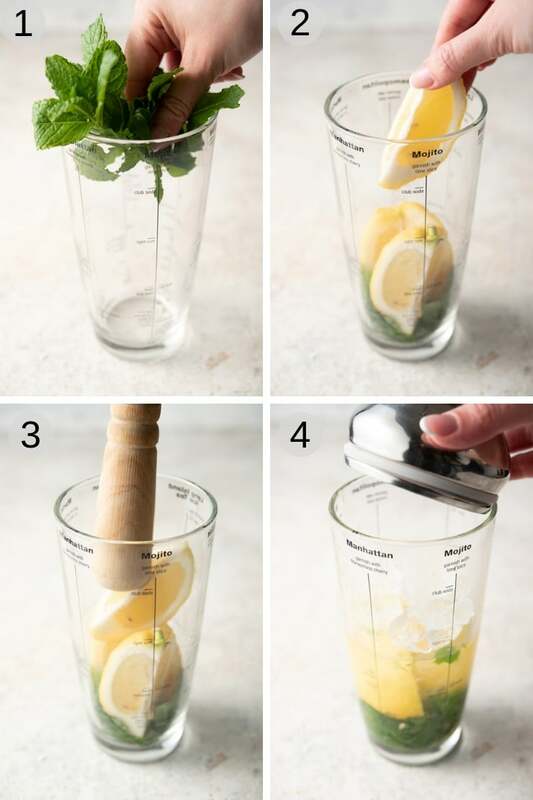 Put the mint leaves,sugar and fresh lemon in a large cocktail shaker and muddle, bashing the lemon and mint until most of the juice is released. Add the limoncello and run and top the shaker with ice. Shake until thoroughly mixed and ice cold. Divide the cocktail between to high ball glasses filled with ice and top up with soda water. Garnish with mint and lemon if desired. Go for a good quality limoncello (homemade is best and way cheaper) but cheap store-bought varieties are often made with artificial lemon powders and don't taste nice. Bashing the mint and lemon juice releases a ton of flavour and juice. Make sure to do it with a wooden pestle if you don't have a cocktail kit so you don't break the glass. 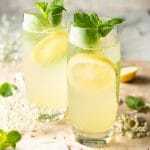 To make it virgin (without alcohol) replace the rum and limoncello with a good fizzy lemonade such as San Pellegrino Limonata and garnish with more mint. It'll be super refreshing and zingy without the booze!